The life of Margaret Tobin Brown is the epitome of being defined as a full life; from the moment she was born in Hannibal, Missouri in 1867, she was destined to live an unconventional life… From her first adventure west to Leadville at the age of 18, traveling to far off corners of the world like Japan and India, making a name for herself on the RMS Titanic, forcing her way to the Denver philanthropic scene and believing that it is never too late to follow your dreams, the life that Margaret lived was a life that a person could be proud of. While she had been a major philanthropic proponent throughout her life, and never settling down or taking time off from a cause, she began to shift her focus’ after the death of her estranged husband, J.J. Brown, in 1922. Though they had been separated for nearly a decade, Margaret had always looked to Denver as her home and her grounding center. With the passing of her husband, Margaret had realized that it was now, or never, to make her lifelong dreams come true. Without hesitation, she had packed up her bags and moved to New York City, and took up residence at the Barbizon Hotel while making her dream of becoming a Broadway performer a reality. Margaret, never one to back down because you think she should, tapped into the new attitudes and perspectives that 1930s America would bring. The world in which Margaret passed in 1932 was a turning point for American history and was a period in which we see the drive of equality and compassion that helped to guide Margaret’s life, start to guide and shape American society. The predominant issue facing America at the time of Margaret’s death was the great depression which began in 1929. By March of 1932, the Market had completely bottomed out, shrinking nearly 27% since the original crash 3 years earlier. July would see the DOW drop nearly 40 points, a near 90% slide, since the crash. The banks were continuing to fail, with nearly 2,500 closing their doors and leaving hundreds of thousands of citizens with no access to the small amounts of money they may have had within the banking system. As a result, the Federal Deposit Insurance Corporation (FDIC) would be established in June of 1933. President Herbert Hoover was quickly becoming overwhelmed with the status of his country; against his best efforts, he had attempted to weaken the government’s debt by increasing the top of the income tax rate to nearly 63%, however, the raise in taxes in fact worsened the depression. 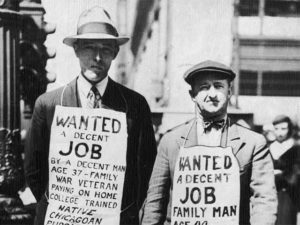 With an economy struggling to get back on track, the unemployment rate rose to 24.1%, the highest it would be until topping out at 25% in 1933. The stock market would not recover from the disastrous crash for nearly 25 years. The everyday economics of the country in 1932 reflected the tumultuous economic world that we had found ourselves in; the average cost of a new home was $6,510, with average annual wages topping out for a middle class worker at $1,650. The politics of the world weren’t much better; 1932 would see Adolf Hitler become an official German citizen after getting appointed to a position within the National Socialist German Worker’s Party. The party, more commonly known as the Nazi party, was established in 1920 and had been slowly gaining momentum politically through the previous decade. By becoming a citizen, Hitler now had the ability to run for President of Germany, and he did just that against the current President Hindenburg. Although Hitler had lost both runs against the incumbent president, the trajectory of history would drastically change in the years to come. The Nazi propagandist, Joseph Goebbels, would be the one responsible for the success of Hitler and his march towards the completion of his Third Reich. Never before had the world seen propaganda used politically in such differing forms: writing, posters, cartoons, film, radio, etc. The ability to harness the visual and audible world of their prospective, and current members, was one of the guiding reasons as to the success of the party. The one uniting, factor that could bring a struggling world together, were the Olympic Games. 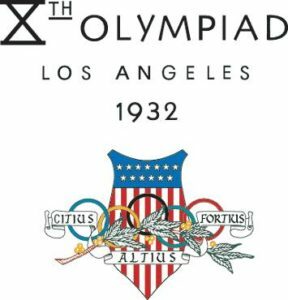 The Xth Olympiad was held in Los Angeles, California in 1932; chosen in 1923 in Rome, no one would know the financial ruin that would be affecting the world in 1932. For the city of Los Angeles, it was a decidedly cheap affair, spending as little of the precious monetary resources that they had. It wasn’t just the coastal city of the United States that was struggling through the Xth Olympiad, financial hardships affected nearly every country, with only 1,503 athletes from 37 countries, showing up to compete, requiring entire events, such as soccer, to be cancelled; compared to the nearly 11,500 athletes who competed in the 2016 Summer Olympics in Rio de Janeiro. Many countries would send their athletes with goods to trade for their trip to America, seeing as they couldn’t afford to pay the lodging and travel costs for their competitors. Countries like Brazil were arriving with bags of coffee; Cuban competitors arrived with pounds of sugar, only to be turned away in Galveston, Texas citing the cost of sugar as being too low to cover Olympic expenses. The hard times didn’t just extended to those arriving from other countries; even local athletes felt the financial squeeze, “George Roth was unemployed and nearly starving in the midst of the Great Depression. He would go to the Olympic Village each day, collect some food and sneak it home to his wife and baby daughter in East Hollywood. 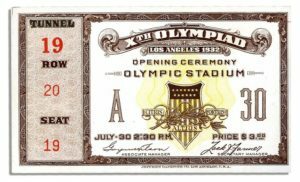 After receiving his gold medal before 60,000 cheering spectators, Roth walked out of the stadium and hitchhiked home.” The United States would end up winning 103 out of 346 medals that year. Through all the discourse, the face of America would begin to drastically change come November 1932, with the historic, landslide election of Franklin Delano Roosevelt. After winning the nomination of the Democratic Party, on the 4th ballot, Roosevelt cried, “I pledge you. I pledge myself. To a new deal for the American people” showing his zeal for changing the country for the better after one of the worst economic downfalls in recent historical memory. 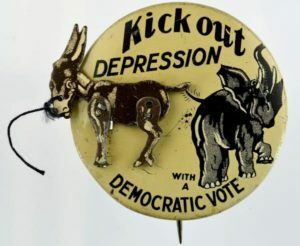 It seemed as if the campaign would take care of itself, with the country having to choose between FDR and his vague ‘New Deal’ promising to raise America’s station and the obvious and apparent shortcomings of Herbert Hoover, who blamed the crash on “external events and alleged that Roosevelt would only intensify the disaster.” Roosevelt would win in a landslide, in both the popular and electoral college vote, garnering nearly 23 million in popular vote compared to the nearly 16 million in which Hoover received, and a 472 to 59 electoral college split. After the election both President Hoover and President-Elect Roosevelt attempted to work together to rectify the crisis gripping the nation, however, the only contribution Hoover could make was to dismantle nearly 90% of Roosevelt’s New Deal. Unable to reach a compromise in the interim months, the country would continue to backslide into a seemingly never ending economic depression. Happening in conjunction with the already fragile economic state, was a new phenomenon that was tearing the western farmlands apart, what has now become colloquially known as the Dust Bowl. 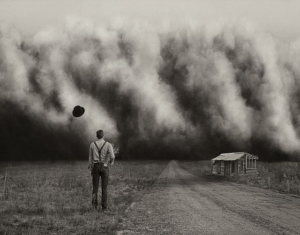 Landing in the middle of the economic depression with the largest dust storm presenting in 1932, the Dust Bowl was a combination of extreme factors, such as over farming of land, low precipitation and failure to provide low ground cover, all added up the perfect storm. Large gusts of wind would whip up walls of dirt and dust as they spread across the United States, reducing visibility on the plains to only 3 feet during the storms. Completely devastating the plains and turning “prairies into deserts” it is remembered as the worst “manmade ecological disaster in history.” A mixture of technological advancements (the tractor) and unusual precipitation patterns had turned the once rolling grasslands of the plains into lucrative wheat farms, encouraging farmers to continue to farm the same crops, on the same lots, repeatedly without giving the lot an opportunity to replenish the soil nutrients. Millions of acres of grassland had been converted into farmland through the 20s, but with the arrival of the great depression, wheat prices plummeted. Rather than scaling back the amount of wheat produced, farmers began to panic and would attempt to get multiple crops out of a single season, leaving the land ravaged and vulnerable to drought. 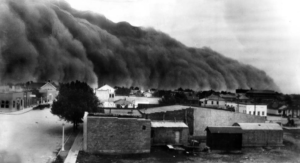 And it did just that in 1932 when one of the country’s largest droughts hit; small gusts of wind would gather up loose dust topsoil and, “they grew into dust storms of biblical proportions. Each year the storms grew more ferocious and more frequent, sweeping up millions of tons of earth, covering farms and homes across the Plains with sand, and spreading the dust across the country. Children developed often fatal “dust pneumonia,” business owners unable to cope with the financial ruin committed suicide, and thousands of desperate Americans were torn from their homes and forced on the road in an exodus unlike anything the United States has ever seen.”  The Dust Bowl wouldn’t official be over until the end of the decade in 1940. For more information on the Dust Bowl, its causes and effects, I would recommend taking a look at the 1937 U.S. Government film The Plow That Broke the Plains, which can be viewed on YouTube here. The world in which Margaret had lived, was a world in transition; living through the reconstruction era of the great Civil War and “snapping, not fading” out of life in 1932 at the height of one of the country’s worst economic downturns. Being a survivor, and making their fortune ironically, after the Panic of 1893 Margaret would be leaving a world that looked eerily familiar. Interested in seeing what else happened in 1932? May 12-Ten weeks after his abduction, the infant son of Charles Lindbergh is found dead just a few miles from his home. August 31-A total solar eclipse is visible from N. Canada through Northeastern Vermont, New Hampshire, south western Maine and the Capes of Massachusetts.